The 508m-high Taipei 101 in Taiwan is one of the tallest buildings in the world. Siemens press picture. Taipei 101 received LEED Platinum certification in 2011. Siemens press picture. 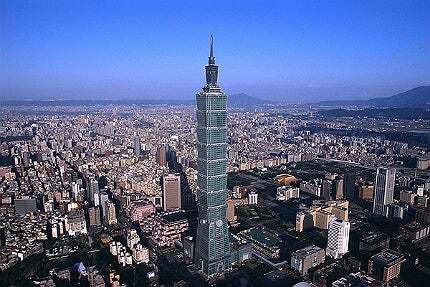 The passive tuned mass wind damper used for Taipei 101 is the largest in the world. Image courtesy of Aj.duplessis. The six-storey shopping mall comprises the podium of the Taipei 101 building. Taipei 101, formerly known as the Taipei World Financial Centre, is a 106-storey building located in the Xinyi District of Taipei in Taiwan. The 508m-high mixed use building, owned by Taipei Financial Centre Corporation (TFCC), is one of the top ten tallest skyscrapers in the world currently. Construction of the $1.8bn skyscraper was started in 1999 and completed in 2004. The high-rise tower was officially opened on New Year’s Eve 2005. The iconic building was designed by Taiwanese architecture firm C.Y. Lee & Partners. Taipei 101 received the LEED-EBOM Platinum certification (Leadership in Energy and Environmental Design for Existing Buildings: Operations and Maintenance) in 2011. It is currently the tallest building to receive such certification. The building also received an award from Guinness World Records for using the world’s fastest elevators. "The building also received an award from Guinness World Records for using the world’s fastest elevators." Taipei 101 is built over a site area of 30,277m². It comprises of 101 stories above ground and five stories below. The six-storey shopping mall from levels one to five forms the podium of the building. The tower structure is stacked peak by peak in eight canted segments above the podium. The floor plate sizes of the tower vary between 2,500m² to 4,300m². The tower’s architectural design is inspired by Chinese ethos. The design of the eight segments of the tower is based on the Chinese lucky number eight. The whole structure resembles a bamboo growing up high, which symbolises upward progress and everlasting strength in Chinese culture. The tower features slanted exterior curtain walls with the facade system comprised of double glazed blue-green glass and aluminium panels. The tower has been erected on 380 concrete piles each sunk 80m beneath the ground. A total of 36 columns, including eight mega columns around the perimeter, provide the vertical support. A Moment Frame System linking the columns on all floors reinforces the whole structure with a massive steel outrigger truss connecting the columns on every eight floors. Taipei 101 uses a passive tuned mass wind damper system for protecting the high-rise building against vibration due to wind. It involves a 5.5m diameter sphere shaped mass block weighing 660t suspended from level 92 to level 87. It is considered as the world’s largest tuned mass damper (TMD) of its kind. The TMD consists of 41 layers of 12.5cm steel plates welded together. The TMD is suspended with eight steel cables 42m in length and 9cm in width. The steel cables are supported by a tune frame situated on level 91 that monitors the building’s vibration and regulates the cable movement accordingly. Eight primary viscous dampers are situated beneath the TMD to absorb and disperse the vibration impact. Also present is a bumper system of additional eight viscous dampers to cushion the building vibration, especially during typhoons and earthquakes. The building features a grand lobby in level one and two. The Taipei 101 shopping mall is located between basement level one and the sixth floor. Three office zones are located at floors 9-34, 35-58 and 59-84 with the elevator transfer floors at level 35-36 and 59-60. An amenities floor and the Taipei 101 conference centre are at level 35 and 36. The building houses observatory multicuisine restaurants in levels 85 and 86. An indoor observation deck is located on the 89th floor and an outdoor observation deck is on the 91st floor. The floors from 92 to 100 are used for telecommunication purpose including television and radio relay stations. Level 101 features a private function room. The mixed-use building has a total floor area of 374,336m². Parking facility with 1,800 car spaces and 2,990 motorcycle spaces is provided at basement levels two to five. The building has 61 elevators and 50 escalators including two ultra high-speed (1,010m/min) single deck observation elevators, 37 passenger elevators, three service elevators and six car park elevators. The sustainable features of the building other than the wind vibration damper system include its facade system which is designed to withstand seismic lateral displacements and to block external heat by 50 percent while providing UV protection. The building also features modern ventilation and air conditioning (VAC) system and an Energy Management and Control System (EMCS) to minimise the energy consumption. Taipei 101 is claimed to be consuming 30% lesser energy than an average building while saving 2,995t of CO2 emissions a year. KTRT JV comprised of Kumagai Gumi, Taiwan Kumagai, RSEA Engineering and Ta-You-Wei Construction was the main contractor for the first phase of construction. "Taipei 101 uses a passive tuned mass wind damper system for protecting the high-rise building against vibration due to wind." Samsung Engineering and Construction was the main contractor for the second phase of construction. Thornton Tomasetti was the structural engineer for the entire project. Motioneering designed and manufactured the TMD of Taipei 101. Evergreen Consulting Engineering was responsible for the overall structural design of the TMD. The building control and management systems, including the EMCS, were provided by Siemens Building Technologies. Siemens also acted as a consultant in partnership with EcoTech International and Steven Leach Associates for the LEED certification of Taipei 101. The escalators and elevators were provided by Toshiba and KONE. Chunghwa Telecom installed the telecommunications infrastructure. Josef Gartner provided the curtain walls for the building. The Leadenhall Building is an 802ft (224.5m) high office tower designed by architecture firm Rogers Stirk Harbour + Partners. Dubai has built one of the world’s largest retail developments (over 12 million square feet) alongside the Burj Khalifa tower.